Wales move into pole position although England could leapfrog back over them with a victory over Ireland on Saturday. Righto, we're off. Join us again tomorrow for Italy-Scotland, which kicks off at 14:25 GMT, before England-Ireland at 16:50. Let's hope it's better than the shambles that was Wales-France. A boring game? Warren Gatland's not having it. "I thought it was brilliant," the Wales coach told the BBC. "It's what Test rugby is all about. We defended brilliantly in the second half. "Things we had worked on looked really good for us. And on the England game in two weeks' time: "Eddie Jones has been saying enough for the both of us. What he says is from the heart. I have no problems with what he's been saying. It's good for the game." Wales captain Sam Warburton tells BBC Sport's Sonja McLaughlan: "It was a very ugly way to win a Test. We kept fighting for territory in the second half. Fair play to France, they kept going for 80 minutes. The plan was to wear them down but it didn't happen. "From our point of view, we played a team with two wins from two and we're undefeated. It really sets it up for Twickenham. "I was thinking to myself 'surely the fans are starting a Mexican wave - it's boring'. No-one really knows what's going on in the scrum, if I'm honest. It will be interesting to look back on." "In the Northern hemisphere we are very good at slowing possession down to prevent the opposition playing. We have got very good at that spoiling and that means that we don't see the game that we would like to - the sort that is played in Australia and New Zealand." "It's frustrating when you watch the game and they're not trying things. We've not seen the simple executions in the Six Nations. We should have game plans - one, two or three moves at least. "If your coach is saying you should just score off opposition mistakes, what is your coach telling you during the week?" There is still 30 minutes of analysis to come on the red button and online, so we'll let you know what the boys are saying. Man of the match Gareth Davies on BBC One: "To be fair to the French they gave us a challenge. It was a scrappy game but a wins a win. On the game against England: "We'll look back at the video. As I said it was scrappy, so we need to get a few things right at Twickenham." That's Wales' fifth successive win against France, stretching back to the semi-final defeat at the 2011 World Cup. Wales go top of the Six Nations table, their next game is against England at Twickenham in two weeks' time. Former All Black Ali Williams, in the BBC studio, looks like he's just been forced to sit through two months' worth of Cash in the Attic. Robert Weller: Gareth Davies has played brilliantly tonight. Meera Patel: This has to be by far the most bizarre yet boring game of rugby I've ever seen! "It's enough to work on. It's a win and Wales never looked like losing, which is good enough." There's the final whistle and we are all put out of our misery. Wales will be happy with the win but as entertainment, it was pretty dire. 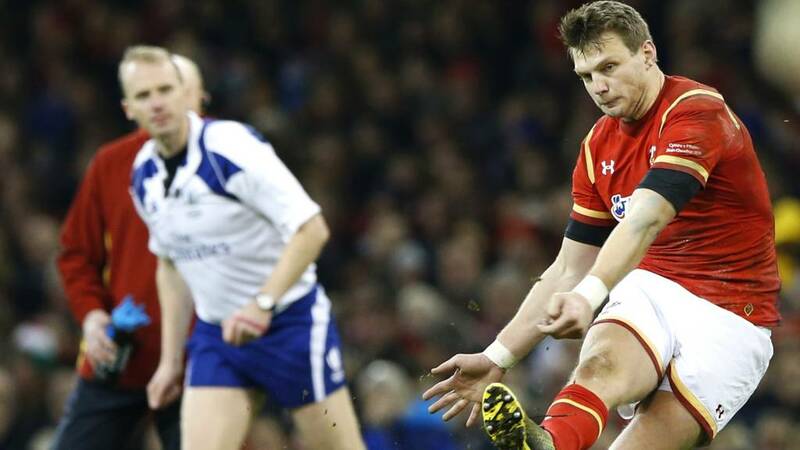 "It was inevitable that that try was going to happen with all the changes disrupting the Wales pack. It is a deserved score for France skipper Guilhem Guirado who has put in a captain's performance." Alan Boyle: Guirado has been by far the best player on the pitch tonight!! Brilliant all round performance!! Guirado caps a fine personal performance with a try from short-range but the French skipper has been ploughing a lonely furrow in Cardiff. Trinh-Duc kicks the conversion. France look to run it from their own 22, nice touch by Trinh-Duc and here he comes on the break... France have had more shape in attack since Trinh-Duch was introduced.